Taming hair isn’t always the easiest thing to do when you are trying to keep your hair and scalp chemical free. Store bought hair gels usually contain chemicals and formaldehyde releasers that can disrupt your hormone production. You need your hormones acting normally to help your hair stay naturally healthy and shiny. Homemade hair gel can be the answer to your problems! Making homemade hair gel is cheap and pretty simple, so I’m going to give you some tips on how to make an easy homemade hair gel that works and doesn’t break the bank! Store bought hair gel does some things to your hair that are extremely undesirable. All the alcohol in hair gel strips off moisture from your hair and scalp. If you apply too much, it will really damage your hair. When your hair gets too dry, your hair becomes brittle and breaks easily. When your scalp dries out, it will become itchy and flaky. You know what that means. You will develop dandruff if you use hair gel too much. Homemade hair gel can really help prevent your hair and scalp from drying out. Because of the all-natural ingredients, your hair can stay healthy as it produces its own natural oils. Those natural oils are the best thing for your hair. What Is Homemade Hair Gel? Homemade hair gel can be pretty easy to make, but there are other options that can take a lot of effort to make! I’m going to go over the easiest methods to make hair gel. Not only is the fastest way easier, I think it is probably even better. Usually homemade hair gel is an all natural hair product, but it can vary by the ingredients you use. These recepies are all natural and healthy for your hair and scalp. Gelatin makes a great ingredient for homemade hair gels. It contains keratin, which is a natural protein found in hair. It is the protein that binds hair, so it naturally helps your hair clump together. A homemade hair gel with gelatin works pretty well. It will also bind to damaged parts of your hair and help restore a smooth look. However, if you use too much hair gel with keratin your hair may lose its flexibility and become prone to breaking. Homemade hair gels should have gelatin, but not too much. That way your hair will hold, but still maintain some flexibility. The ingredients are pretty easy to come by. To make some good homemade hair gel all you need is some plain gelatin, and some heated water. There are also some other things you can add to make it smell better. Some people recommend using a few drops of your favorite essential oil or using a little lemon juice. I don’t prefer to use lemon juice because the citrus prevents the gelatin from having optimal consistency. The essential oils seem to not affect it so much except to add a great smell. To make this gel, just dissolve your gelatin into your warm water.. If you want a light holding gel, dissolve about one fourth a teasopoon of gelatin into the water. To have a strong holding gel, double the amount of gelatin. Don’t add any more gelatin than that or else you will probably get a gel that is too firm and makes your hair brittle. There are some downsides to this type of homemade hair gel. One of the major ones is that it can spoil. To keep it fresh you need to keep it refrigerated. Once it goes bad, it really goes bad. It will start to have a very strong smell, and it isn’t a good one. I don’t know how to describe it, but trust me, you will know it has gone bad. This is my favorite homemade hair gel. Aloe Vera gel in and of itself is a great hair gel all by itself. You can add a little essential oil to it and give it a pleasant aroma and immediately use it in your hair. Aloe is a great moisturizer for your hair. If you choose to use it as your hair gel, you will not have to worry about your hair gel causing dandruff or damaging your hair. 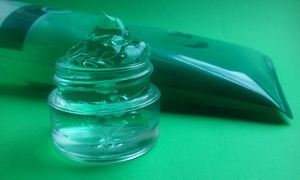 Aloe Vera gel is good at room temperature for anywhere from 3 to 5 months. This homemade hair gel is a little more complicated to make. I think it is a little unnecessary because it is more expensive and has no real advantages over the other two. To make the flaxseed gel you will need two and a half teaspoons of flax seeds, ¾ a cup of distilled water, and essential oil for scent. Boil the water and flax seeds, then take it down to a simmer for 10 minutes. Line a mesh sieve with cheesecloth and then strain your boiled mixture through. Then use tongs or something similar to squeeze out any gel that didn’t escape the cheesecloth. The homemade hair gel that comes out of the flaxseed will be good for about ten days before it spoils. Aloe Vera or gelatin based homemade hair gels are pretty easy to make and they work out pretty well. The flaxseed gel is tedious to make without having any real benefits, but do if the other two don’t work out for you, you might want to try it. There are great benefits to using homemade hair gel, but it should be clear that it isn’t going to work like pomade or hair glue. Hair gel will hold your hair together and in place, but it won’t give you unlimited styling potential. Homemade hair gel isn’t difficult to make, and it can save your hair from the damage that store bought hair gel can do to your hair and scalp.